ANAHEIM, Calif. (AP) After losing 10 of their previous 11 games away from home, the Toronto Blue Jays got timely plays to break out of their rut. Steve Pearce hit a three-run homer in the ninth inning and the Blue Jays ended a five-game road losing streak with a 4-1 victory over the Los Angeles Angels on Saturday night. ”We needed it. We did it in dramatic fashion, and sometimes that’s what you need to start a little streak,” said Pearce, who is 4 for 6 in two games since returning from the disabled list because of a strained oblique. Pearce’s fourth homer was a line drive down the left-field line off Justin Anderson (1-2), who gave up a two-out single to Aledmys Diaz and walked Devon Travis to bring Pearce to the plate. Pearce was waiting for a slider, and Anderson left it hanging over the middle of the plate. Marcus Stroman threw five scoreless innings for the Blue Jays, who had lost 10 of their last 11 on the road. Stroman, who had not started since May 8 because of shoulder fatigue, allowed six hits and one walk. Stroman said it was his best performance of the season, able to effortlessly switch between pitches that he described as ”easy” and ”natural” coming off his hand. After going through a limited spring training because of inflammation in his shoulder, Stroman treated his stint on the disabled list as a second chance to get his body ready for the season. ”I thought he looked like the old guy,” Blue Jays manager John Gibbons said. Teoscar Hernandez gave the Blue Jays a 1-0 lead on his solo home run in the third. The shot to left-center was the 13th this season for Hernandez, who went 2 for 4. Los Angeles had its three-game winning streak snapped. The Angels used five rookie starters, including right-hander Jamie Barria, who gave up one run and four hits, and walked four in five innings. 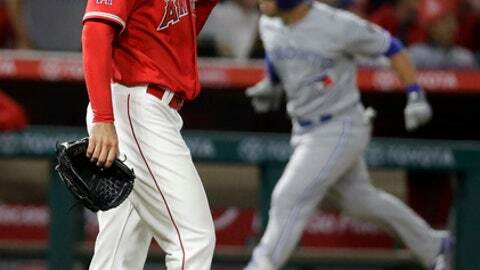 The Angels had a chance to tie it in the bottom of the third after loading the bases with one out, but Russell Martin tagged out David Fletcher at home plate to end the inning. Valbuena popped out to short center, and Kevin Pillar’s throw home arrived ahead of the rookie second baseman. Blue Jays: RHP Aaron Sanchez (right finger contusion) and LHP Jaime Garcia (shoulder) were placed on the disabled list Saturday. LHP Tim Mayza was recalled from Triple-A Buffalo. Angels: DH/RHP Shohei Ohtani (elbow) will be re-evaluated Thursday and will not travel with the team during its upcoming 10-game road trip. … C Rene Rivera (right knee) was transferred to the 60-day disabled list. Blue Jays: RHP Sam Gaviglio (2-2, 3.75 ERA) is seeking his first win since May 25. He has allowed seven runs in 7 1/3 innings in his last two starts. Angels: RHP Felix Pena (0-0, 5.40) will make his second career start. Pena faced the Blue Jays as a reliever with the Cubs last season, striking out all three batters he faced.